Powers: She projects a physically hard shell around her in the shape of any cartoon animal she’s ever seen. 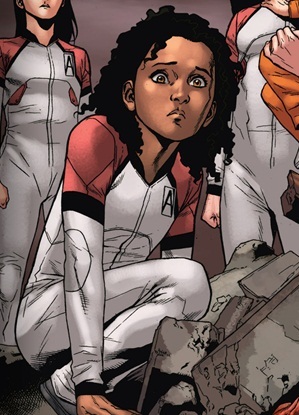 Age 12 [Harbinger Wars #2, 2013], She was a prisoner of the PRS (Project Rising Spirit) who were being groomed as living weapons. They escaped from the facility during the Harbinger wars [Harbinger Wars #1 2013]. She was with the group that escaped with Cronus and landed in Vegas. Along the way she has to kill a few humans to protect her friends [Harbinger Wars #1 and #2, 2013]. When Harada arrived she was taken down by his ‘Hyper Psychics’ who took her into custody [Harbinger #17, 2013]. Her mind and powers prove tricky and she is contained separately and sedated. Strangely while her conscious mind is sedated her unconscious mind projects three of her favorite characters capable of independent thought. The constructs kill her jailers and plan to wake the creator [Harbinger #17, 2013]. Powers: She projects a physically hard shell around her in the shape of any CARTOON animal. I’ll pass it on, heh. That should be Generation Zero, I think. I’ll double check.